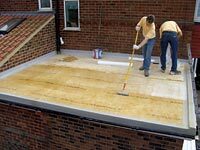 At Matrix we offer a two hour fibreglass roofing training course for professional contractors. The cost is £40 + VAT payable at the time of booking. How to lay a fibreglass roof (and you get 20 years of our mistakes for free). As a group, you will help to build a small section of GRP roof, including trims. This course will not make you an expert fibreglass roofer, but you will learn the first principles, and how to avoid common problems. In addition to the course, we would also encourage you to study the comprehensive videos at the FixMyRoof website. It is based in our premises in central Bristol. The course lasts for about two hours. We usually have a maximum of five contractors, so there's lots of chance for questions. Our GRP training courses are in great demand - so please try to book well in advance. Either fill in the on-line booking form (and we will call you to arrange a date), or just call the office on 0117 954 8045 to set a date and make a payment.